The Himalaya is a mountain range in Asia, separating the Indian subcontinent from the Tibetan Plateau. By extension, it is also the name of the massive mountain system which includes the Himalaya proper, the Karakoram, the Hindu Kush, and a host of minor ranges extending from the Pamir Knot. The name is from Sanskrit himālaya, a tatpurusha compound meaning «the abode of snow». (from hima «snow», and ālaya «abode»; see also Himavat). Together, the Himalaya mountain system is the planet’s highest and home to all fourteen of the world’s highest peaks. the Eight-thousanders, including Mount Everest. To comprehend the enormous scale of Himalaya peaks, consider that Aconcagua, in the Andes, is at 6,959 m the highest peak outside the Himalaya, while the Himalaya system has over 100 peaks exceeding 7,200 m.
The Himalaya stretches across five nations, Bhutan, China, India, Nepal, and Pakistan. It is the source of three of the world’s major river systems, the Indus Basin, the Ganga-Brahmaputra Basin and the Yangtze Basin. An estimated 750 million up people live in the watershed area of the Himalayan rivers, which also includes Bangladesh. The Himalaya (pronounced with a long «a»: Himaalaya) range runs for about 2400 km, from Nanga Parbat in the west to Namche Barwa in the east. The width varies between 250-300 km. The Himalayan range comprises three parallel ranges, arranged by elevation and geological age. The youngest of the three is called the Sub-Himalayan range (Siwalik hills in India) and has an elevation of about 1200 m. This range is made up of erosion material from the rising Himalaya. Running parallel to this is the Lower Himalayan range, which has an elevation between 2000–5000 m. A number of Indian hill stations such as Shimla, Nainital and Darjeeling are located here. The northernmost range is called the Higher Himalaya and is also the oldest of the three. It has an elevation of more than 6000 m and contains a large number of the world’s highest peaks including the three highest, Mount Everest, K2 and Kanchenjunga. The Pakistani states of Baltistan, and the Indian states of Jammu and Kashmir, Himachal Pradesh, Uttaranchal, Sikkim and Arunachal Pradesh lie mostly in the Himalaya. The southern part of the Tibet Autonomous Region of China also lies on the Himalaya. The flora and fauna of the Himalaya varies with climate, rainfall, altitude, and soils. The climate ranges from tropical at the base of the mountains to permanent ice and snow at the highest elevations. The amount of yearly rainfall increases from west to east along the front of the range. This diversity of climate, altitude, rainfall and soil conditions generates a variety of distinct plant and animal communities, or ecoregions. On the Indo-Gangetic plain at the base of the mountains, an alluvial plain drained by the Indus and Ganges-Brahmaputra river systems, vegetation varies from west to east with rainfall. The xeric Northwestern thorn scrub forests occupy the plains of Pakistan and the Indian Punjab. Further east lie the Upper Gangetic plains moist deciduous forests of Uttar Pradesh and Lower Gangetic plains moist deciduous forests of Bihar and West Bengal. These are monsoon forests, with drought-deciduous trees that lose their leaves during the dry season. The moister Brahmaputra Valley semi-evergreen forests occupy the plains of Assam. Above the alluvial plain lies the Terai belt, a seasonally marshy zone of sand and clay soils. The Terai has higher rainfall than the plains, and the downward-rushing rivers of the Himalayas slow down and spread out in the flatter Terai zone, depositing fertile silt during the monsoon season and receding in the dry season. The Terai has a high water table, and the central part of the Terai belt is occupied by the Terai-Duar savanna and grasslands, a mosaic of grasslands, savannas, deciduous and evergreen forests that includes some of the world’s tallest grasslands. The grasslands of the Terai belt are home to the Indian Rhinoceros (Rhinoceros unicornis). Above the Terai belt is an upland zone known as the Bhabhar, with porous and rocky soils, made up of debris washed down from the higher ranges. The Bhabhar and the lower Siwalik ranges have a subtropical climate. The Himalayan subtropical pine forests occupy the western end of the subtropical belt, with forests dominated by Chir Pine (Pinus roxburghii). The central part of the range is home to the Himalayan subtropical broadleaf forests, dominated by sal (Shorea robusta). At the middle elevations of the range, the subtropical forests yield to a belt of temperate broadleaf and mixed forests, with the Western Himalayan broadleaf forests at the western end of the range, and the Eastern Himalayan broadleaf forests in Assam and Arunachal Pradesh. Above the broadleaf forests are the Western and Eastern Himalayan subalpine conifer forests. Above the tree line are the Northwestern, Western, and Eastern Himalayan alpine shrub and meadows, which yield to tundra in the higher Himalayan range. The alpine meadows are the summer habitat of the endangered Snow Leopard (Uncia uncia). The highest reaches of the range are above the permanent snow line. The Himalaya are among the youngest mountain ranges on the planet. According to the modern theory of plate tectonics, their formation is a result of a continental collision or orogeny along the convergent boundary between the Indo-Australian Plate and the Eurasian Plate. The collision began in the Upper Cretaceous period about 70 million years ago, when the north-moving Indo-Australian Plate, moving at about 15 cm/year, collided with the Eurasian Plate. By about 50 million years ago this fast moving Indo-Australian plate had completely closed the Tethys Ocean, whose existence has been determined by sedimentary rocks settled on the ocean floor and the volcanoes that fringed its edges. Since these sediments were light, they crumpled into mountain ranges rather than sinking to the floor. The Indo-Australian plate continues to be driven horizontally below the Tibetan plateau, which forces the plateau to move upwards. The Arakan Yoma highlands in Myanmar and the Andaman and Nicobar Islands in the Bay of Bengal were also formed as a result of this collision. The Indo-Australian plate is still moving at 67mm/year, and over the next 10 million years it will travel about 1500 km into Asia. About 2 cm/year of the India-Asia convergence is absorbed by thrusting along the Himalaya southern front. This leads to the Himalaya rising by about 5 mm/year, making them geologically active. The movement of the Indian plate into the Asian plate also makes this region seismically active, leading to earthquakes from time to time. The Himalayan range encompasses a very large number of glaciers, notable among which is the Siachen Glacier, the largest in the world outside the polar region. Some of the other more famous glaciers include the Gangotri and Yamunotri (Uttaranchal), Nubra, Biafo and Baltoro (Karakoram region), Zemu (Sikkim) and Khumbu glaciers (Mount Everest region). The western rivers combine into the Indus Basin, of which the Indus River is the largest. The Indus begins in Tibet at the confluence of Sengge and Gar rivers and flows southwest through Pakistan to the Arabian Sea. It is fed by the Jhelum, the Chenab, the Ravi, the Beas, and the Sutlej rivers, among others. Most of the other Himalayan rivers drain the Ganga-Brahmaputra Basin. Its two main rivers are the Ganges and the Brahmaputra. The Ganga originates as the Bhagirathi from the Gangotri glacier and flows southeast through the plains of northern India, fed by the Alaknanda and the Yamuna among other tributaries. The Brahmaputra originates as the Tsangpo in western Tibet, and flows east through Tibet and west through the plains of Assam. The Ganga and the Brahmaputra meet in Bangladesh, and drain into the Bay of Bengal through the world’s largest river delta. The Salween, Mekong, the Yangtze and the Huang He (Yellow River) all originate from parts of the Tibetan plateau that are geologically distinct from the Himalaya mountains, and are therefore not considered true Himalayan rivers. Some geologists refer to all the rivers collectively as the circum-Himalayan rivers . In recent years scientists have monitored a notable increase in the rate of glacier retreat across the region as a result of global climate change. Although the effect of this won’t be known for many years it potentially could mean disaster for the hundreds of thousands of people that rely on the glaciers to feed the rivers of northern India during the dry seasons. The Himalaya region is dotted with hundreds of lakes. Most lakes are found at altitudes of less than 5,000 m, with the size of the lakes diminishing with altitude. The largest lake is the Pangong t’so, which is spread across the border between India and Tibet. It is situated at an altitude of 4,600 m, and is 8 km wide and nearly 134 km long. The highest lake is the Gurudogmar in North Sikkim 5,370 m (17,600 feet). Other major lakes include the Tsongmo lake, near the Indo-China border in Sikkim. The Himalaya has a profound effect on the climate of the Indian subcontinent and the Tibetan plateau. It prevents frigid, dry Arctic winds from blowing south into the subcontinent, which keeps South Asia much warmer than corresponding temperate regions in the other continents. It also forms a barrier for the monsoon winds, keeping them from traveling northwards, and causing heavy rainfall in the Terai region. The Himalaya are also believed to play an important part in the formation of Central Asian deserts such as the Taklamakan and Gobi deserts. Due to the mountain ranges, the western disturbances which appear from Iran during winter are prevented from travelling any further, resulting in snow in Kashmir and rainfall for parts of Punjab and northern India. Despite being a barrier to the cold northernly winter winds, the Brahmaputra valley receives part of the frigid winds, thus lowering the temperature in the northeast Indian states and Bangladesh. These winds also cause the North East monsoon during this season for these parts. Gangtok in Sikkim to Lhasa in Tibet, via the Nathula Pass and Jelepla Passes (offshoots of the ancient Silk Route). Bhadgaon in Nepal to Nyalam in Tibet. The road from Srinagar in Kashmir via Leh to Tibet. This pass is now less used because of regional troubles. The Himalaya, due to its large size and expanse, has been a natural barrier to the movement of people for a long time. In particular, this has prevented intermingling of people from the Indian subcontinent with people from China and Mongolia, causing significantly different languages and customs between these regions. The Himalaya has also hindered trade routes and prevented military expeditions across its expanse. For instance, Genghis Khan could not expand his empire south of the Himalaya into the subcontinent. Chomolangma or Qomolangma -«Mother of the Universe» 8,844 29,028 World’s highest mountain. First climbed 1953. K2 Chogo Gangri 8,611 28,251 World’s 2nd highest. First climber 1954. Kanchenjunga Kangchen Dzö-nga 8,586 28,169 World’s 3rd highest. First climbed 1955. Lhotse — 8,501 27,939 World’s 4th highest. First climbed 1956. Makalu — 8,462 27,765 World’s 5th highest. First climbed 1955. Cho Oyu Mt. Zhuoaoyou 8,201 26,906 World’s 6th highest. First climbed 1954. Dhaulagiri White Mountain 8,167 26,764 World’s 7th highest. First climbed 1960. Manaslu Kutang — «Mountain of the Spirit» 8,163 26,758 World’s 8th highest. First climbed 1956. Nanga Parbat Nangaparbat Peak or Diamir 8,125 26,658 World’s 9th highest. First climbed 1953. Annapurna «Goddess of the Harvests» 8,091 26,545 World’s 10th highest. First climbed 1950. Gasherbrum I Hidden Peak (Khumbu Gangri) or K5 8,068 26,470 World’s 11th highest. First climbed 1958. Broad Peak K3 (Phalchen Gangri) 8,047 26,400 World’s 12th highest. First climbed 1957. Gasherbrum II K4 8,035 26,360 World’s 13th highest. First climbed 1956. Gosainthan -Sanskrit for «place of the saint», 8,027 26,289 First climbed 1964. 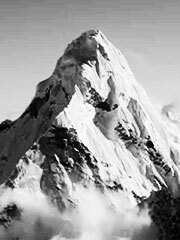 Gyachung Gangri — 7,922 26,089 First climbed 1964. Nanda Devi «Bliss-Giving Goddess» 7,817 25,645 Highest mountain within India. First climbed 1936. Bumo Gangri «Unmarried Daughter» 7,161 23,494 Popular climbing peak. First climbed 1962. Several places in the Himalaya are of religious significance in Hinduism and Buddhism. In Hinduism, the Himalaya have also been personified as the god Himavat, the father of Shiva’s consort, Parvati. Kedarnath, where one of the 12 Jyothirlingas is located. Deoprayag, where the Alaknanda and Bhagirathi merge to form the Ganges. Mount Kailash, a 6,718 m high peak which is considered to be the abode of the Hindu god Shiva and is also venerated by Buddhists. Lake Manasarowar lies at the base of Mount Kailash, and is the source of the Brahmaputra. A number of Tibetan Buddhist sites are situated in the Himalaya, including the residence of the Dalai Lama. The Yeti is one of the most famous creatures in cryptozoology. It is a large primate-like creature that is supposed to live in the Himalaya. Most mainstream scientists and experts consider current evidence of the Yeti’s existence unpersuasive, and the result of hoaxes, legend or misidentification of mundane creatures. Shambhala is a mystical city in Buddhism with various legends associated with it. While some legends consider it to be a real city where secret Buddhist doctrines are being preserved, other legends believe that the city does not physically exist and can only be reached in the mental realm. Shangri-La is a fictional utopia situated somewhere in the Himalaya, based on the legendary Shambhala. It is described in the novel Lost Horizon, written by the British writer James Hilton in 1933. The Hollywood movie Vertical Limit (2000), is set in the K2 peak of the Himalaya.